This weekend I was on a mad hunt for new nightstands. The budget for my lady's boudoir makeover is stretched thin as it is, so an affordable vintage/Craigslist makeover sounded just right when recalling that the total cost of my dresser makeover was around $55, my dining chairs were $90, and the chair in my living room was $35. So Saturday afternoon I hit up a couple of my go-to thrift stores in Lakeview and Lincoln Park. First stop was my beloved junk shop, The Brown Elephant on Halsted. But I left there empty-handed and ventured to two other resale shops, both of which are brilliantly curated and offer fantastic (although not always cheap) goods. Unfortunately, at the end of the day, I had zero luck in the nightstand department, but I wanted to share some other great pieces these stores were offering. 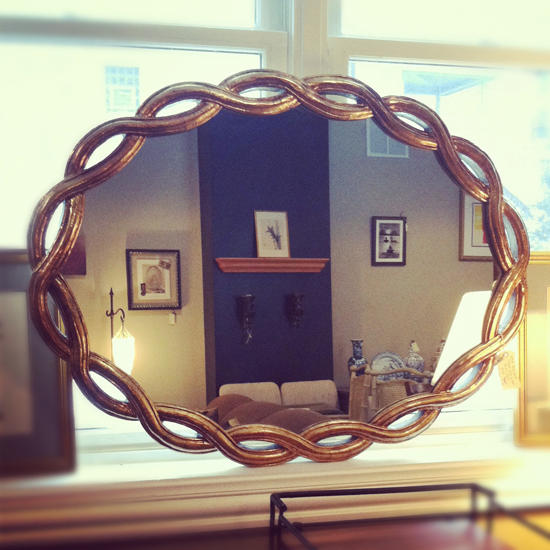 This braided gilded mirror was only $100 and would easily work in a bedroom, dining room, entryway, bathroom... pretty much anywhere. The unique designs of these orange velvety nailheaded delights reminded me something I'd see in Elle Decor. Truth be told, I think they were priced accordingly. The set of four was over $1000. Oh, how I loved these stools! Would like to see them opposite my couch in the living room. 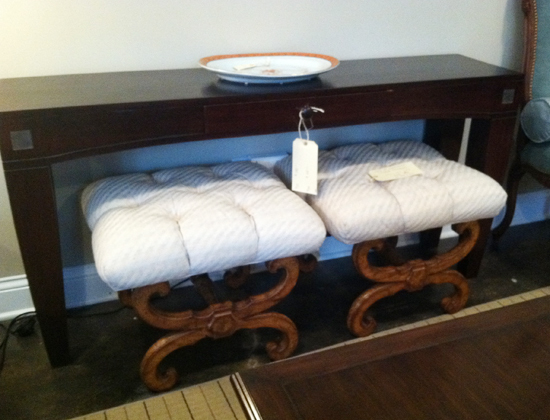 Lacquer up the base and reupholster the tufted seat - perfection. And the set was just $150. 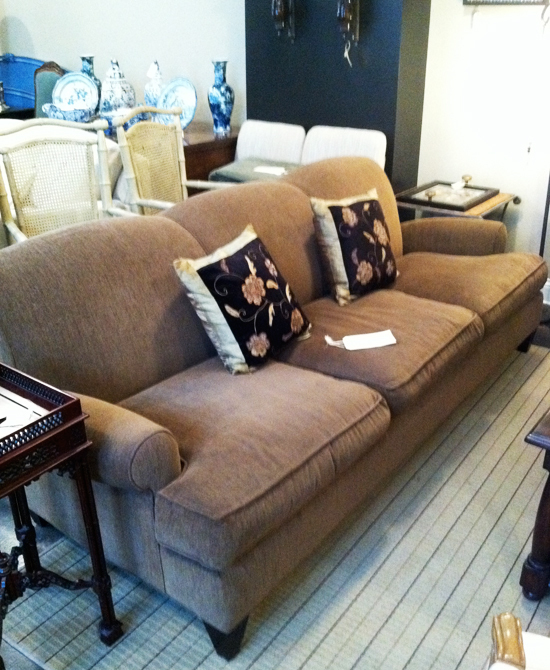 And English roll arm sofa for $900? Originally from Room and Board. Would definitely need to be reupholstered (I'm thinking yellow - a la Jenna Lyons'), but it was still a great price for such a large couch. 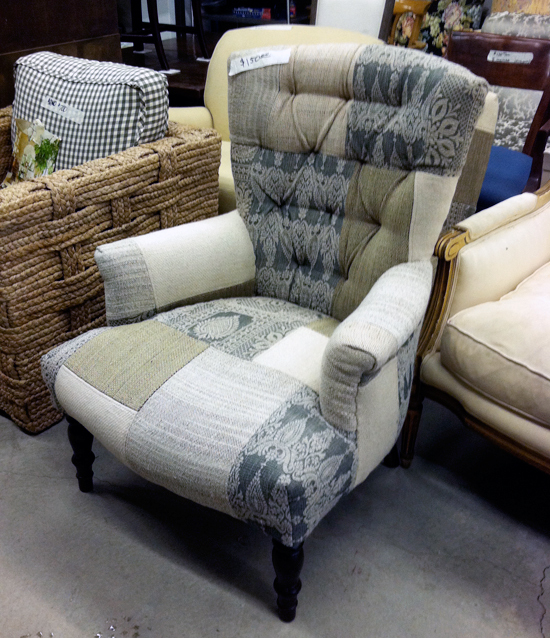 Loved the tufting and shape of this lil' chair. I can picture it recovered in a blush pink! You'll notice it's only $150; I'm guessing you could have gotten it down to $100. Not bad at all. 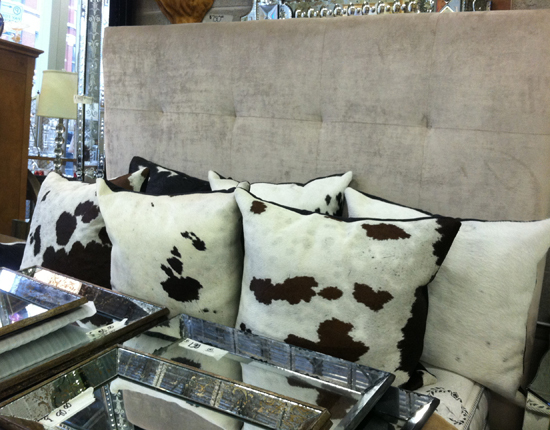 Loved these cowhide pillows. And there were a gagillion mirrors lining the wall and stacked on furniture around the store. Perty. 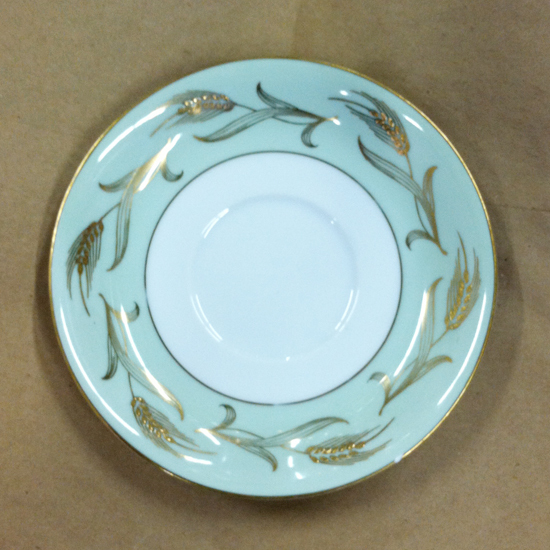 This minty green and gold collection of Noritake China - we're talking 11 full place settings plus a whole lot of serving pieces - was $250. Considering a five-piece Noritake place setting sells for a little less than that at Macy's, this was an unbelievable steal. And the color! I LOVE minty green. I probably would have purchased the set of China had I not given my heart away elsewhere. 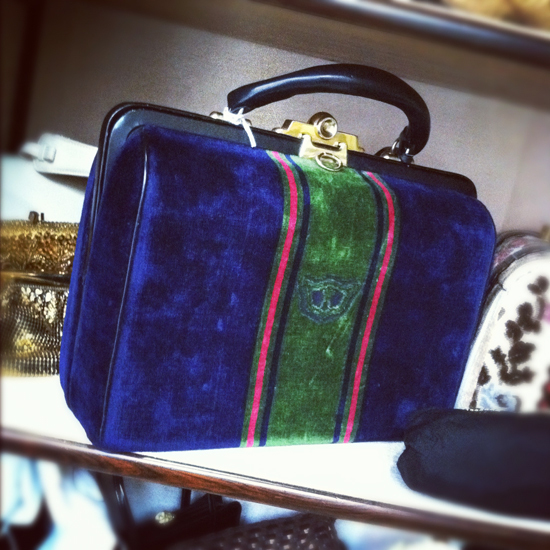 I saw this striped velvety bag in a glass case, and I got all starry-eyed with little birds and butterflies fluttering around my head. Turns out it's vintage Roberta Di Camerino, an Italian designer, and similar styles go for $500+ on eBay. This was $250, which was still a lot more than I was planning on spending that day. Of course, it's two days later and I'm still thinking about it. 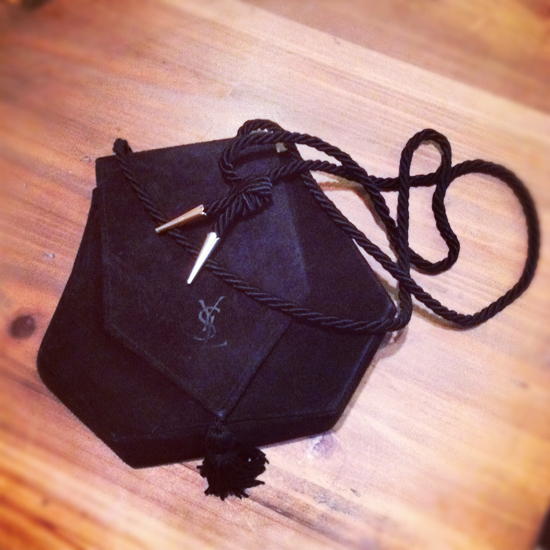 Lucky me did find and purchase this vintage YSL evening bag. Loved the tassel, the gold tips on the strap, and the funky shape. It holds all the bare essentials: iPhone, credit cards, lipstick, keys. I already wore it out Saturday and love the fact it can be draped cross-body to free my hands for dancing and sipping cocktails. Best part? It was $30! I know. Amazing. 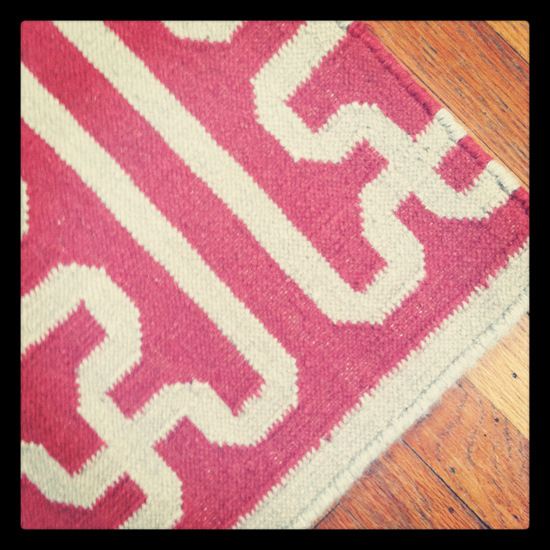 ...this pink geometric rug arrived and is laying cool in a top-secret location in my home. 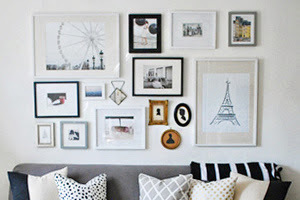 All part of my colorfied 2012 home makeover goal. I want the first mirror, the pair of stools and the china! Unfortunately the travel expenses would make them slightly less affordable... ;) Great find though!! 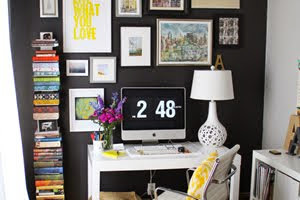 Love the pink rug in the last photo..can you tell us what website you found it on??? So many wonderful finds! I love that YSL bag - the shape is so unique. What a steal! Seriously!! That couch is beautiful and definitely comfortable. I think my biggest problem with finding a couch was the fact that beautiful couches are not comfortable/don't look inviting. This one beat it all! Looks like I have two more stores to visit on my list. I love finding a new thrift/antique store! Um, and the china is gorgeous! LOVE the ysl bag and the rug?? so cute!! cant wait to see it in your room! Too bad about not finding the nightstands but that YSL purse makes it well worth it...what a great buy! I always tell myself that part of the fun for finding vintage furniture is the hunt, but somehow that doesn't help my impatience when I just want to find the right piece "now". Good luck! P.S. I just stumbled across your blog is weekend and LOVE IT. This is making my heart hurt. Whyyy did I ever have to leave Lincoln Park? Oh, the treasures. I LOVE those stools and that braided mirror. Im partial to neutrals, but I can't wait to see your colorfied home! Love that gold mirror but I have to say, that YSL bag is the ultimate find! Congrats lady! Looks like you had a great weekend with fabulous finds! That braided mirror is amazing. I've been looking for a unique above-the-dresser mirror for weeks and I haven't seen anything as cool as that! I do love looking around Millionaire Rejects -- so many fun pieces! Your bag is perfect, and I'm really loving your new pink rug, too! Wow, all those pieces are so fun!! 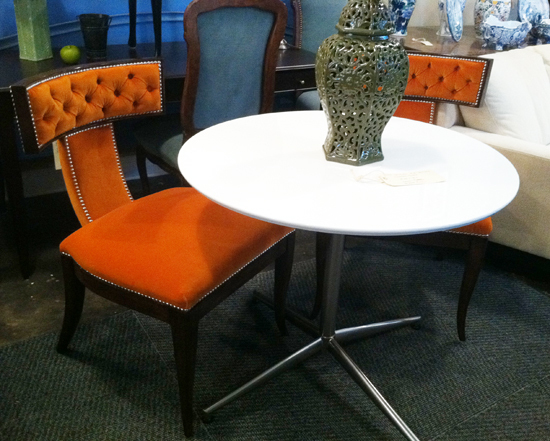 Im in total love with those orange velvet chairs and tufted white stools!! Gorgeous!!! Such amazing finds! That YSL bag is amazing! You really ended up with something special. Btw, do we get to know where the pink rug is from?! So lucky you found that YSL purse it's lovely! I absolutely love both these sources - and oh, my that YSL bag?! Have you checked out classic remix on webster - it's another one of my favorite stores to visit (product wise and for inspiration). Thanks for sharing your trip! I love and frequent all three of these shops, but Brown Elephant is my absolute favorite. It's definitely hit or miss though. Luckily, I live pretty nearby, so I pop in often. If I see any standout nightstands, I'll let you know! Okay, LOVE your finds! But...do you ever worry about bed bugs? Creepy, I know, but worth asking.